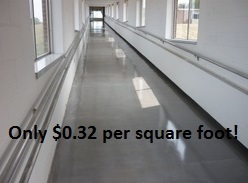 Only $0.32 per square foot! Description: Vi-Prime Epoxy Primer is a two-component, penetrating, high solids pigmented waterborne epoxy primer. Vi-Prime has excellent bonding to concrete and can be used as a stand alone protective coating for concrete floors. It is environmentally firendly with no VOC's or solvents. It also has a low odor application. Once applied, the primer has excellent resistance to wear and incidental contact with typical automotive chemicals which makes this primer ideal for garages and automotive shops. Vi-Prime is easy to use as it has a one to one mix ratio. Vi-Prime can be used as a primer or a stand alone coating.